7 Kids and Us: Phenom Nutrition Shakes for Active Kids! Kids compete in more sports today than ever before. Give your young athlete every advantage. Phenom Young Athlete is designed to promote healthy lean muscle growth, while speeding recovery and refueling natural energy. Our shake is a precise 2:1 protein to carb ratio. We have utilized only the finest ingredients without compromise. Unlike 99% of the protein drinks available, we start with non-rBGH and non-rBST proteins. That means our proteins are sourced from cattle, free of hormones and steroids. *This healthy protein blend will help the muscles build and recover quickly. Our carb source is a synergistic blend of non-GMO sweet potatoes and non-GMO whole grain brown rice. These simple and complex carbohydrates are easily digestible and quickly refill the body’s glycogen (fuel source), so your young athlete can go longer and stronger. We include just enough electrolytes to help hydration. And unlike the competition, there are NO artificial sweeteners, NO aspartame, NO sucralose and NO artificial colorings. 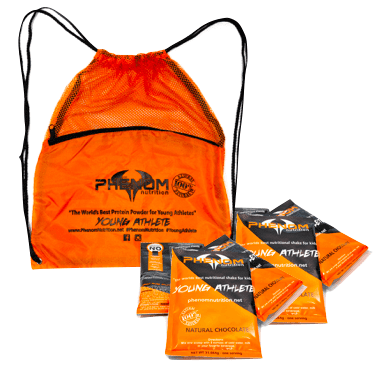 Phenom Young Athlete is sweetened with natural stevia leaf and monk fruit. Our chocolate is from pure cocoa bean and natural flavorings. Put our ingredients side by side with the competition. We think you will agree…THERE IS NO COMPETITION!